- Meticulously handwoven and "One of a kind" piece crafted in the finest quality New Zealand wool with a beautiful design pattern. - The design has pendulum-like medallion giving it a unique look. - The design has been originated from Persia and has an Iranian influence from the 17th century. - The main colors are ivory, soothing orange, rust and gold The design has been originated from a town in Persia called Kashan. - The border has tiny floral motifs woven in unison. 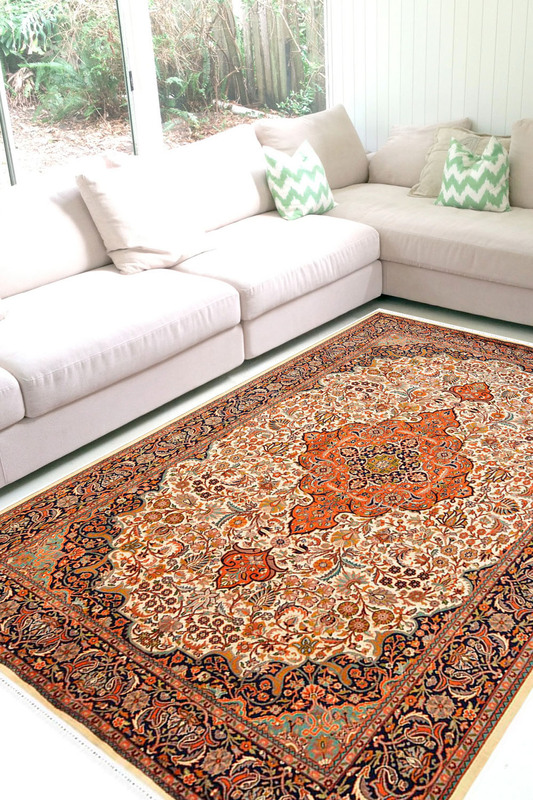 - This type of rug should be used as a feature rug in a space with subtle interiors or neutral tones.